Artiodactyl. River horse. Hippopotamus. It doesn’t matter what it’s called, you’re fascinated. It’s the third-largest mammal on earth (behind the elephant and the rhinoceros). It’s a vegetarian who eats grass. It spends its days trying to stay cool in water or mud. It has a barrel-shaped body, a mouth full of tusks, and weighs more than 3,000 pounds (males). Plus, despite its short legs, it can run nearly 20 miles per hour. The usually lazy creature is actually one of the most dangerous animals in the world. So you’d love to see a bloat—that’s really what a group are called—of them in the wild. Hippos live in Africa, specifically East Africa south of the Sahara, around lakes and rivers. But, due to their ivory teeth and meat, their numbers are drastically dwindling. They’re now considered a vulnerable species by conservation groups. 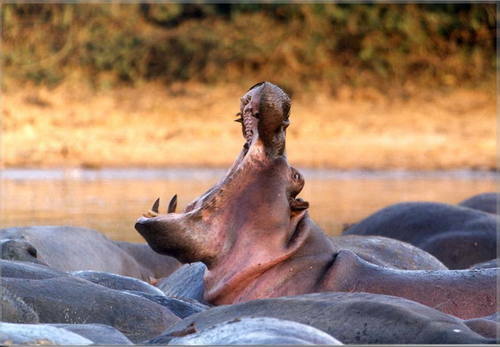 The Central African savanna once had one of the largest concentrations of hippos in the world. They lived along the grassy floodplains of the Bahr Aouk and Bahr Kameur Rivers in Manovo-Gounda St. Floris National Park. Black rhinos, Sudan cheetahs, red-fronted gazelles, and Cape buffalo lived here, too. But poor park management, illegal grazing, and heavily armed poaching decreased the park’s animal population by up to 80 percent. After four park staff members were shot, tourism came to a virtual halt. The park and the hippos were in trouble. Manovo-Gounda St. Floris National Park is in the Central African Republic. Since declaring its independence from France in 1960, the landlocked country has undergone one coup attempt after another. It’s long been considered one of the most dangerous and lawless places in the world. So the park, established in 1979 and upgraded to UNESCO status in 1988, never stood a chance. But there’s a glimmer of hope now. The African Conservation Trust, a not-for-profit organization, has partnered with the Central African Republic’s government to manage the park. They’ve established breeding programs to begin reviving the wildlife. Hopefully the animal population, including the hippos, will start making a comeback soon. Now the rest of the country just needs to follow the park’s path.